Samsill Black Portfolio. Classic Collection. Traditional styling with finest professional appearance. Leather like cover with sewn edges and nickel plated corners. Convenient pockets inside. Pen loop and 11 x 8.5" writing pad. "Rose-Hulman/R/Institute of Technology" on nickel oval. 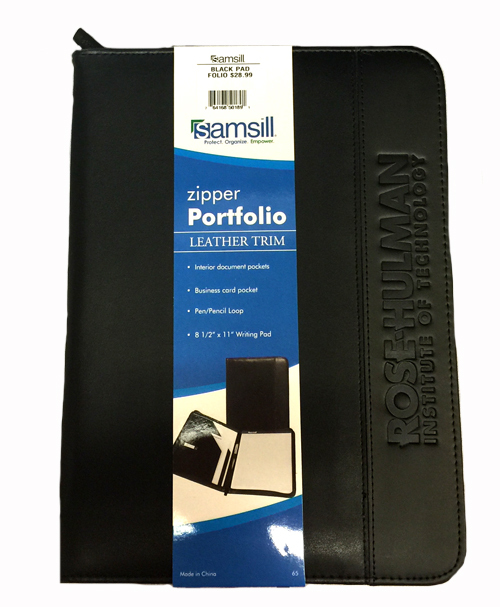 Samsill Black Zipper Portfolio. Leather trim. Interior document pockets. Business card pocket. Pen/Pencil Loop. 8.5" x 11" Writing pad. "Rose-Hulman/Institute of Technology"
Samsill Navy Portfolio. Classic Collection. Traditional styling with finest professional appearance. Leather like cover with sewn edges and nickel plated corners. Convenient pockets inside. Pen loop and 11 x 8.5" writing pad. "Rose-Hulman/R/Institute of Technology" on nickel oval.